A stainless steel tube with a conductivity of 1.43 MS / m and a relative permeability of 1 is inspected with an encircling coil. The tube has an outer diameter of 32 mm and a thickness of 8 mm. The probe operates in separate transmission and reception. It consists of an emitting encircling coil and two receiver encircling coils separated by 2 mm, whose geometrical properties are gathered in the figure below, representing the panel in CIVA in which these properties have to be defined. 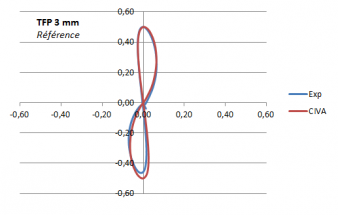 The acquisition is carry out at a frequency of 50 kHz, with 1mA injection and a differential reception. Geometrical properties of the probe, left panel: transmitting coil, right panel: receiver coils. In this study, two inspection configurations are involved. In the first case, the tube is correctly centered in the coil, which corresponds to the optimum inspection configuration. 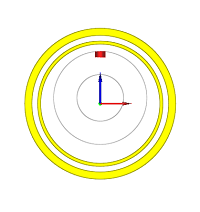 In the second case, the axis of the coil is off-centered by 2 mm with respect to the axis of the tube, as it can be seen below. This shift is usually caused by the vibrations of the tube. 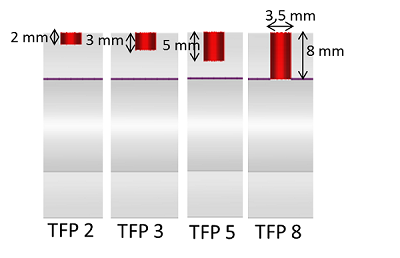 The piece contains 4 flat bottom holes (FBH) with a diameter of 3.5 mm and different depths, as shown in the figure below, the last FBH being through. The simulations are calibrated from the FBH of 3 mm depth. 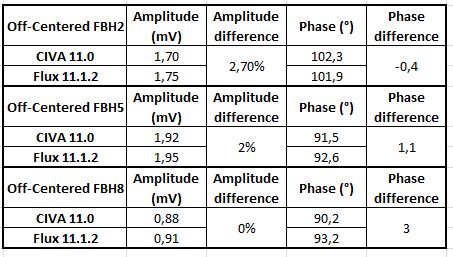 We thus present the comparison results between CIVA and the experiment of FBH 2, 5 and 8 (through). 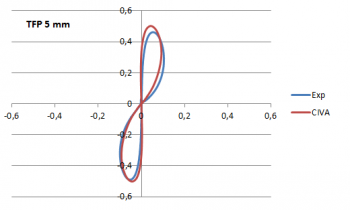 These Lissajous curves confirm the good agreement CIVA / experiment observed in the table of comparisons. 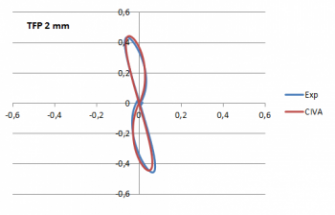 The CIVA simulation results were also compared with the results of the finite element code Flux 3D, developed by Altair. 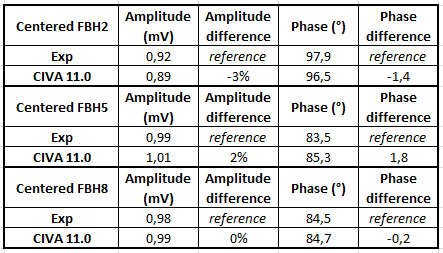 The amplitude and phase differences are given in relation to the experimental results. 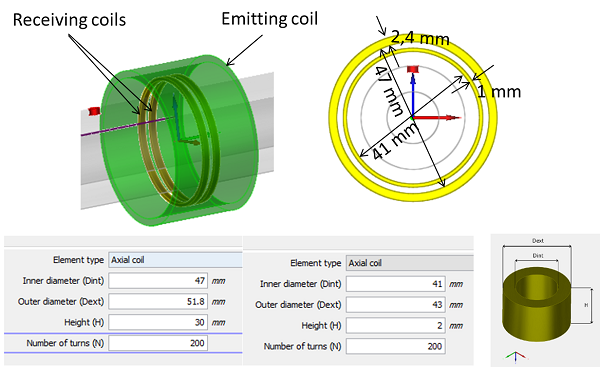 The results obtained with the off-centered coil with respect to the axis of the tube are gathered in the table below. 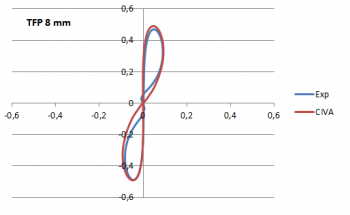 In this case only the CIVA and Flux codes are compared, there are no experimental references but the previous results show that the simulations results are reliable compared to the experiment. 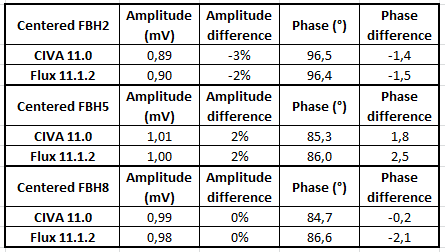 These results show that CIVA and Flux are in agreement, with a maximum of 3% difference in amplitude and 2.5 ° in phase. These results were published at the ECNDT congress in 2014 article in the Working Group COFREND "Eddy Current NDT modeling": Benchmarks for validation and improving simulation codes acceptation.